Just 10 days ago, Jasmin Paris became the first woman to win the Spine Race, and also smashed the winter record for the route by around 12 hours. This non-stop, unsupported trail ultramarathon is one of the world's toughest. Even more impressively, Jasmin was having to express milk at checkpoints. Sarah Stirling asks her a few questions about the race; also about running while pregnant and as a mother. In total, Jasmin was out on the 268-mile course of the Montane Spine Race for a staggering 83 hours and 12 minutes. She had to carry with her everything she needed, as the race is unsupported. And what's more, only seven of those hours included resting, sleeping, eating, and having to express milk. It's a staggering feat of endurance, grit, and determination. The will to continue must be strong, and the body must be fit enough to see it through. The previous record of 95 hours and 17 minutes was held by Eoin Keith, set back in 2016. And this year, when the race started at 8am on 13 January from Edale, Jasmin was quick to show her colours by setting pace with Eoin and Eugeni Rosello, another past winner and strong competitor. To begin with, the trio moved as a team, forging ahead and pulling away from the pack. Later in the race, Jasmin and Eugeni then left Eoin behind. Having to stop to sleep, Eugeni was then left lagging and Jasmin pushed on even harder. Something remarkable seemed in the making. But could Jasmin keep up such a gruelling pace without being hit by the toll of running so hard with little rest or sleep? The trio maintained their positions for much of the race until Eugeni, a mere 6km from the finish line, succumbed to the combined hardships of the race, the weather, and the sleep deprivation, and he was forced to retire. But it mattered little to Jasmin, as she was unstoppable. Jasmin finished the race to smash all the previous records. The existing female record of 109 hours and 54 minutes was beaten by a humungous 26 hours and 42 minutes, and more amazingly the existing men's record by a staggering 11 hours and 48 minutes. With Eugeni out of the race, Eoin took second place arriving in a time of 98 hours and 18 minutes. Third place went to John Knapp who finished in 102 hours and 19 minutes. Amazingly, 20 hours after Jasmin crossed the finish line, only two others had completed the race. Some background on Jasmin: she is a vet who works at the University of Edinburgh. In 2015 Jasmin came first female in the Dragon's Back Race, and finished second overall. In 2016 she broke the women's records for all three of the UK's big fell running challenges: the Paddy Buckley, Bob Graham and the Ramsay Round. Her Ramsay time was an overall record as well. Jasmin hadn't planned to be expressing milk during the race, but two back-to-back viral infections set baby Rowan's planned weaning back; so during the race her mum had to express so it didn't get uncomfortable. First of all, massive congratulations! What was the highlight of the race? The last day in the Cheviots was stunning, one of those mountain days that you remember for the rest of your life. Sunshine, clear blue sky, and later thousands of stars. It is pretty remote towards the end there, and very beautiful. Funnily enough, the hardest bit for me was probably during the first night. I was missing my daughter most at that point, and I still had around 200 miles to run. Later on I felt more focused, my body had switched into race mode, and I knew I was getting closer to home, all of which made things easier. How do you fit training around motherhood? It’s not easy, but I think it’s doable, if you want it badly enough. My husband and I are both runners, so we take it in turn to train and look after our daughter. I tend to run very early in the morning (4.30 or 5 am) before work, which leaves me free later on to spend time with my daughter. My mum looks after her during the day, and is a huge support to us in this respect. Finally, I very rarely have a lie in, and we don’t have a television, which probably helps, too. Do you run with a buggy sometimes? Yes, especially the park run on a Saturday, where the buggy allows us to compete as family. I wouldn’t run a hard training session with the buggy, but I do sometimes take it when I’m doing a recovery run, or if I add a second easy run to my day. How much did you run while pregnant and what are your thoughts on this; some doctors/books seem to advise doing very little exercise, while others say 'do what you feel'? I have some friends who have been left feeling rather confused! I ran up until the day my daughter was born. I understand that the medical advice is to continue doing existing exercise up to a moderate level providing there are no specific contra-indications. I was very fortunate to have a straightforward pregnancy, and never felt particularly awkward whilst running with a bump. My approach was simply to listen to my body, and slow down to keep things comfortable. Did you encounter any criticism while running with a bump? No, my experience was quite the opposite. The fell running community were as always extremely welcoming, open and supportive. It’s one of the reasons I love the sport I do. You ran it in an amazing time – what drives you, how or why do you keep going so hard over such a long tough races and challenges like these? What goes through your mind, what mental tactics do you use? It helps that I love being in the hills, so most of the time at least part of me is enjoying the experience. During the tough patches on this race I distracted myself by imagining my baby daughter, her expressions, the way she squats down and examines something… Just thinking about her was enough to raise my mood. 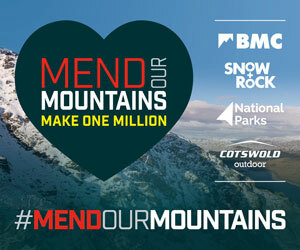 Montane are the BMC's recommended clothing and pack partner. Join online today by Direct Debit and save 50% on your first year's membership. New Hill Walkers Booklet: A comprehensive introduction to the skills, equipment and know-how you need to walk in the mountains. Download the booklet for free or order free copies from the BMC shop. Hill Walking Essentials DVD: Follow Fredelina and Ben as they learn essential skills and techniques for the British mountains. Buy it now in the BMC shop. What a ride! There was a bash, and then a smash, followed by some VR soloing and big screen adventuring at the BMC Sheffield Adventure Film Festival 2019. We had a blast and we hope you did too – here are our highlights of the festival. What was your best bit? It was time for the BMC AGM 2019 at the dazzling Devonshire Dome in Buxton. A number of changes were up for vote and attending members got to find out the results first-hand. From the Volunteer Awards ceremony to the Members' open discussion, there was a lot of positivity and optimism about the future of the BMC. And when the results came through, it got even better.